Heat exchanger is a process equipment designed for the effective transfer of heat energy between two fluids; hot fluid and a coolant. The purpose may be either to remove heat from a fluid or to add heat to a fluid. Micro-channel Heat exchanger tube is one such heat exchanger in which the working fluid flows through a plurality of passages with hydraulic diameter less than few mm (typically 0.2 to 0.01mm). Project Report is attached at the end of this Mechanical Project Topic. These kinds of heat exchangers are widely used in condensers of vehicle air conditioning systems. 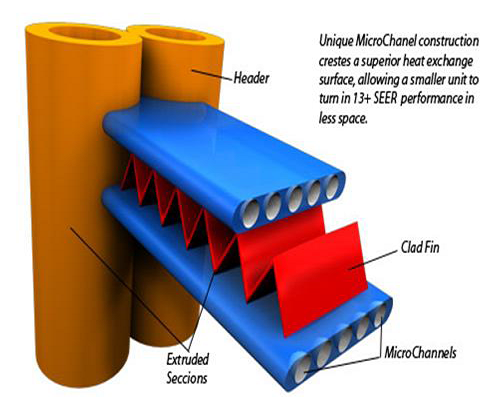 These heat exchangers, typically consists of plurality of micro-channel passages attached horizontally in between two headers which are placed vertically, and corrugated fin stacks interposed between the tubes. Generally, all of these members are made up of Aluminum. However, use of such micro-channel heat exchangers is avoided in evaporators of household air conditioning systems because of various problems. Major reasons being, condensation of moisture, difficulty in proper distribution of two phase mixture at inlet(mal distribution), difficulty in achieving uniform flow of refrigerant and slower speed of flow of air around the evaporator compared to vehicle AC condenser. For overcoming the above challenges, various micro-channel heat exchanger configurations are discussed in the report. Several solutions are provided for using micro-channel heat exchanger as evaporator in small unitary air conditioning systems, which are compact, has high heat transfer efficiencies and is capable of effectively draining the condensed moisture and also in which refrigerant is distributed uniformly. Micro-channel heat exchangers have been used earlier in particular applications like radiators of automobiles for vehicle air-conditioning with 3-4 m/s flow where there wasn’t any issue of condensation of moisture from air, and icing. The problems with existing heat condensers are tripping of system at higher condenser pressure, water temperature being not so high, refrigerant flow getting choked in few coils, water flow being less due to high pressure drop and hence ensuring overall poor performance of the condenser. d is the hydraulic diameter of the channel. For internal laminar flows, Nu becomes a constant. For constant wall temperature Nu is 3.657 and for constant heat flux case, Nu is 4.364. The flow is predominantly laminar for flow through small diameter pipe. When used as condensers, the headers are placed vertically, and micro-channel tubes are oriented horizontally. In evaporators, if such configuration is used, the condensate tends to remain in place of fins and tubes and gets frozen. This blocks the air passage, and hampers the heat transfer characteristics and reduces the efficiency of the evaporator. Also, compared to the flow speed of air available in condensers used in vehicle air conditioning (3-4m/s), the speed of air flow in household air conditioning evaporators is very less (0.5-1.5m/s). Hence requires a larger heat transfer area. Unlike condenser, the refrigerant in evaporator is transformed from liquid phase into vapor phase in evaporator, so it is difficult to apply the channel structure of condenser to evaporators. Since, the refrigerant at the inlet of evaporator is two phase mixture; the distribution of refrigerant in headers is also difficult. As a result, despite of various disadvantages, other type of heat exchanger configuration besides MCHX are being used as evaporators. There is an urgent need to improve upon the features. Thus a solution that can bring up the use of MCHX as evaporators is needed. It can be also useful in future study of heat exchangers. The overall objective of this report is to conduct the testing of MCHX used as evaporators in air conditioning system, which should be compact, having high heat transfer efficiency, in which condensed water discharge is easy, and in which refrigerant is distributed uniformly. Relevant literatures on MCHX options are studied and the information gathered from the literatures was used for testing of the different types of models of systems. Reasonable assumptions were taken while testing MCHX and conventional evaporators. Working on the studied the different models of MCHX used as evaporator. Testing of the preferred MCHX model so chosen. Observe the readings & calculate the velocity, heat transferred and other needed parameters. Direct contact - The energy transfer between the hot and cold fluids is brought about by their complete physical mixing; there is simultaneous transfer of heat and mass. Examples: water cooling towers, jet condensers in steam power plants. Regenerator - The hot fluid is passed through a certain medium called matrix. The heat is transferred to the solid matrix and accumulates there. This stored heat is then transferred to cold fluid by allowing it to pass over the the heated matrix. Examples: regenerators of open hearth, glass engine and gas turbines. Parallel flow/Co-current flow - In this arrangement, the fluids enter the unit from the same side, flow in the same direction and subsequently leave from the same side. Counter flow - The fluids enter the unit from opposite ends, travel in opposite directions and subsequently leave from the opposite ends. Cross flow - The two fluids are directed at right angles to each other. Examples: air or gas heating, automobile radiator, cooling unit of ac duct. The Counter-flow arrangement ensures the maximum heat transfer as LMTD value (log mean temperature difference) is greater than the parallel flow. Concentric tubes - Two concentric pipes are used, each carrying one of the fluids. The direction of flow may correspond to unidirectional or counter-flow arrangement. Shell and tube - One of the fluids is carried through a bundle of tubes enclosed by a shell. The other fluid is forced through the shell and flows over outside surface of the tube. Condenser - The hot fluid remains at constant temperature all along its passage through the heat exchanger, whilst the temperature of the other fluid (coolant) gradually increases from inlet to outlet. Evaporator - During heat exchange, the cold fluid evaporates at constant temperature whilst the temperature of hot gases continuously decreases from inlet to outlet. Economic considerations such as cost, ease of manufacture etc. To first double-check the flow of the condenser heat exchange as the water isn’t heating up as expected and Aluminium plates are getting hotter instead. Hence the counter-flow arrangement should be well ensured of as it will comply with the best results to be attained. As already mentioned, this arrangement gives the best heat transfer rate as compared to parallel flow or cross-flow. If the setup works satisfactorily, then matrix materials like sand (having high thermal conductivity of 0.06 kg/mK and large grit size of 3mm) must be introduced so as to serve the purpose of heat storage. Meanwhile it must also ensure to minimize the problems involved because of MCHX as an evaporator. These issues have been discussed in the table. To resolve these issues, the low flow of air as 0.5-1.5 m/s in evaporator must be levelled with large heat transfer area. As nanotechnology is slowly mushrooming up, use of microchannels heat exchangers will foresee more innovative and techno-savvy creations. As concluded, they are better replacement for conventional fin-tube MCHX evaporators.